Being in hospitality industry for over four decades Jetwing Hotels goes the extra mile to ensure that responsible tourism and unique experience goes hand in hand. Through the efforts of resident naturalists at Jetwing properties spread all over Sri Lanka, guests are provided the opportunity to learn about nature firsthand, with no harm to the environment or habitats. 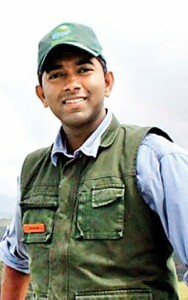 One such individual is Ishanda Senevirathna, resident naturalist at Jetwing St. Andrew’s, Nuwara Eliya. Ishanda takes great pleasure in passing on his knowledge of fauna to travellers by taking them on an exciting night trail in the wetland behind the hotel which was designed and developed to attract wildlife. To date, the wetland has attracted over 35 species of birds including 5 endemic to Sri Lanka, 12 species of butterflies, 4 species of dragonflies and 10 species of amphibians including 3 endemic species, as observed by Ishanda – the frog-life in the area is a source of great fascination for him, and is the only tour of its kind in the country at present. Ishanda is an environmental enthusiast and shows great passion for the natural world up in the hills. His wealth of knowledge is awe-inspiring as he shares intricate details of the frogs and their lifestyles during the adventurous night trail. Q: How did your interest in the environment and nature begin? Ever since I was a child, I’ve always had a constant curiosity towards nature. This curiosity was nurtured and developed from my early school years right through to today. Currently, I am a member of the Young Zoologist Association (YZA) of Sri Lanka and Young Explorers (YE School Organisation) – at which point that curiosity has now developed into a passion! Volunteering in these organisations has equipped me with the necessary knowledge to become a naturalist. However, it was that initial childhood spark of curiosity and inspiration that has led me to become the naturalist that I am today. Q: Tell us about your educational background, qualifications and achievements in your field of interest? While receiving my education at Kingswood College, Kandy I was heavily involved with the Youth Exploration Society and in time I was appointed the Vice President in the club. I then went on to pursue my studies on aquatic life, mammals, and reptiles where I received a certificate on the same. I continued to broaden my knowledge as I acquired a Diploma in Bio Diversity Management and a Post Graduate Diploma in Environmental Management. Currently, I am reading for my Masters in Environment Management at the University of Colombo. 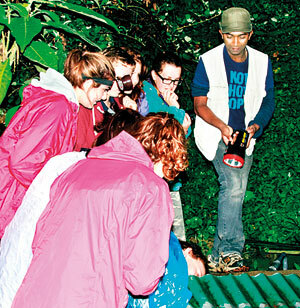 Q: Tell us about your discovery of the frog excursion at Jetwing St. Andrew’s, Nuwara Eliya. I joined Jetwing St. Andrew’s in 2011 during which time I was studying about reptiles. Part of my job was to engage in nature tours but we could not take our guests on long distant tours owing to the fact that they usually check out in the morning. As a result, I went around the property in the night into our gardens and wetland wherein I discovered a frog habitat. I spotted up to 10 species of frogs along with many more night creatures. The tour begins at 7.00p.m and will take approximately 1.5 hours; starting at the hotel wetland area moving past the frog pond and into the forest. So far we have received great reviews on the night trail; guests remain fascinated when they get a good glimpse of bio diversity in such a short period of time. Q: What plans do you have as a naturalist and what are your personal goals? My main goal is to promote frog watching as a unique tour in Sri Lanka. 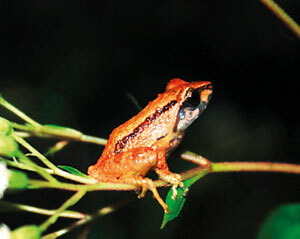 We have rich frog diversity, therefore we can definitely promote frog watching as a distinctive nature tour. Promoting such in-house excursions similar to frog watching will minimise wildlife pressure on national parks, and encourage observation and education. My hope is that it will become a unique ecotourism activity that will benefit the local community which will make them conserve the frog diversity in their area, as we have three critically endangered species for example.